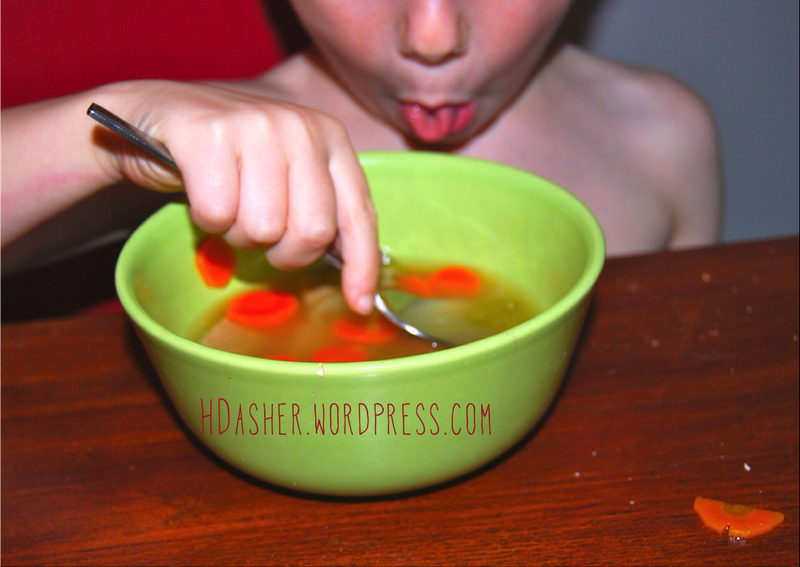 When I was a kid, my Mom made this soup every time one of us didn’t feel well. It’s one of those memories you can taste when you think of it. She did a more traditional version with chicken and white flour noodles. 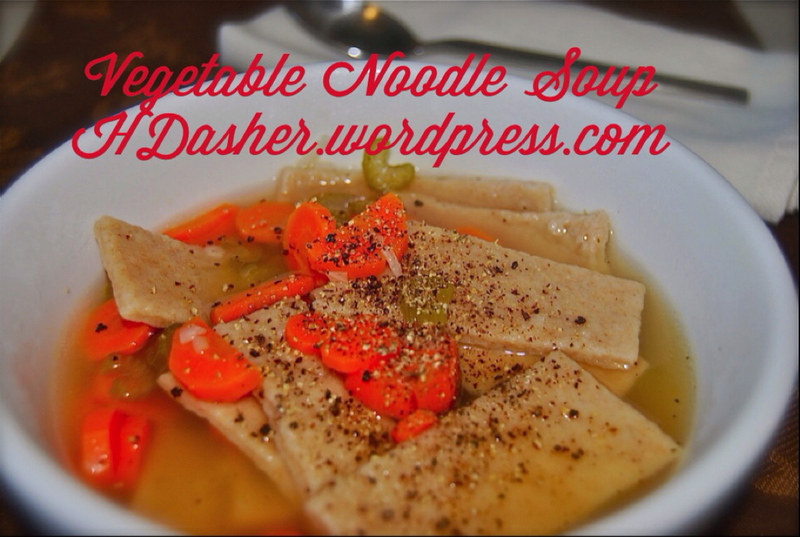 My version is full of fresh vegetables and the noodles are half whole wheat but with the same comforting flavor. I wish I could take a photo of the smell that fills the house when it simmers on the stove. 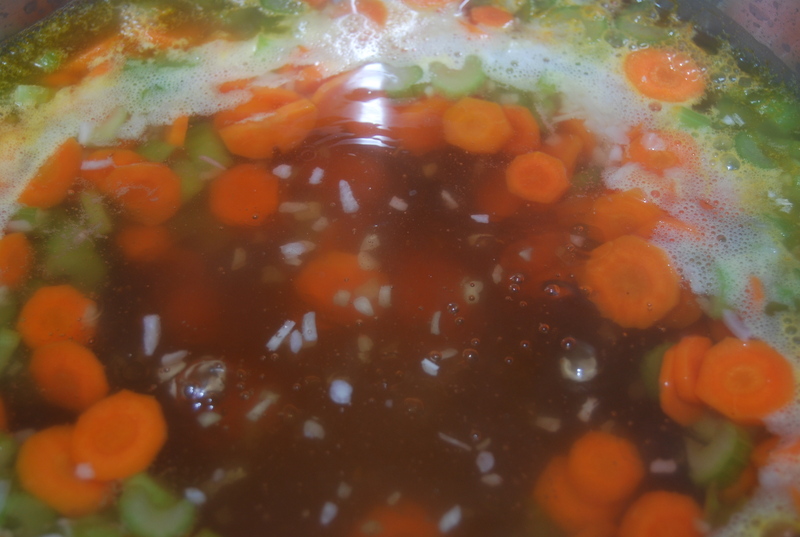 Pour 14 cups vegetable broth in a large pot. Add 10 large sliced carrots and 8 stalks celery, sliced. Bring to a simmer, then add 2 Tablespoons dried onion, 2 bay leaves, and one teaspoon each dried thyme, garlic powder and oregano. While you’re waiting for the soup to heat, make the noodles. In a large bowl, mix 1 1/2 cups all purp. flour and 1 1/2 cups whole wheat flour. Add 1 teaspoon salt and 1/2 teaspoon garlic powder. 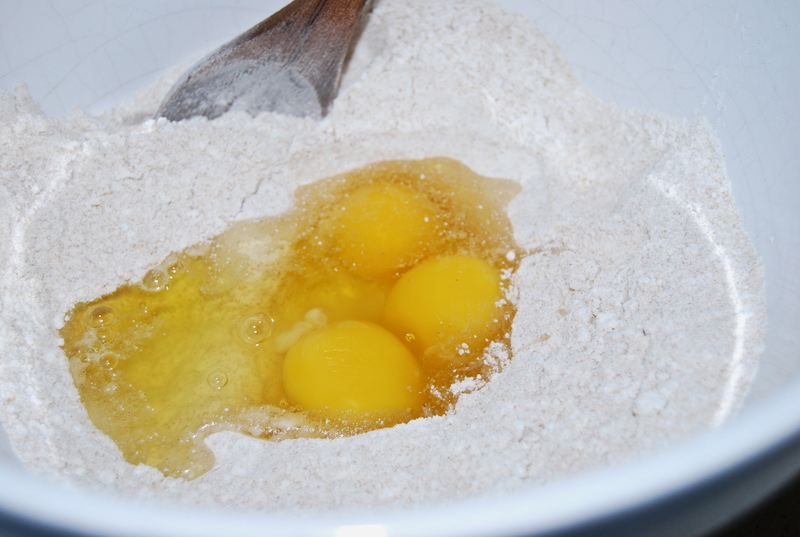 Make a well in the center and add 3 large eggs and 5 Tablespoons water. Mix and add more water by the Tablespoon if it’s too dry. You want a pliant dough that is slightly sticky. 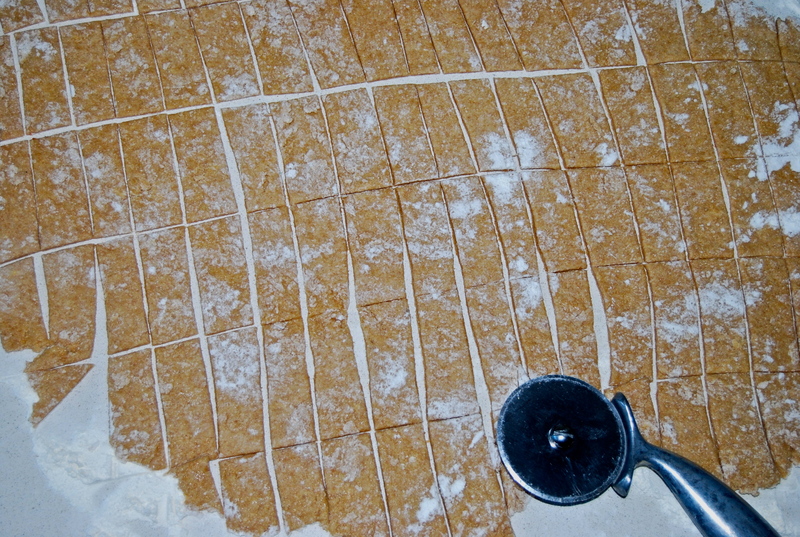 Turn out onto a well floured surface and roll to 1/4 inch thick. 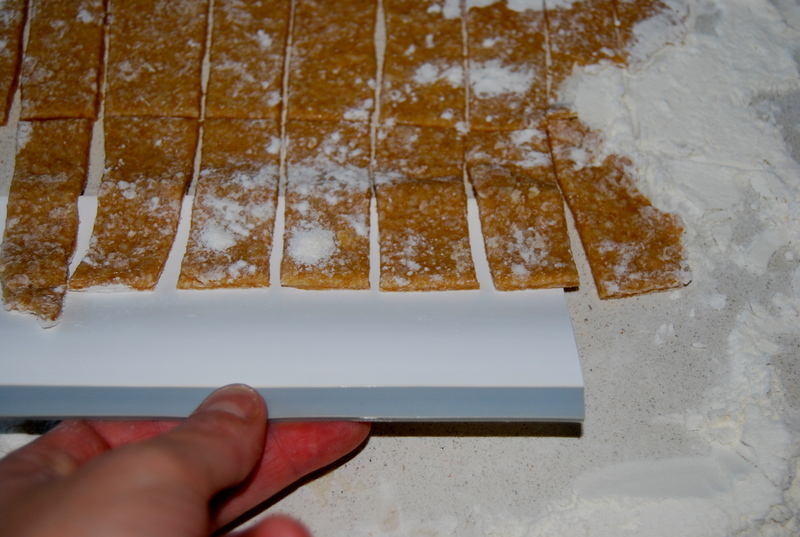 Slice into noodles with a pizza cutter or sharp knife. My 4 yr old loves to help with that step and its the perfect job to let him get involved. You really can’t go wrong with the noodles, the size doesn’t have to be uniform. Let the noodles dry slightly for around 15 minutes while the soup simmers. Once the vegetables are almost tender bring the soup to a boil, then add the noodles. A bench scraper is handy to have for this part since you don’t want to add the noodles in a giant clump. Let the noodles boil for 5 minutes and serve with freshly cracked black pepper. Yummy! This recipe is so simple and rustic and it can be personalized easily. Sometimes I add chopped parsley or basil, frozen peas or broccoli. And of course, you can use chicken or even tofu.